Millions of items are put on layaway every day at thousands of retail stores. The idea is simple: you can lock in the price of an item, pay a small amount to secure the right to pay it off over time, and eventually claim the good from the layaway department when it is paid in full. The question, though, is whether or not credit cards present a better opportunity to layaway services when you do not have the cash to pay up front. 1. Layaway first – Provided that you can wait for an item, layaway is a great way to start making interest-free payments toward a particular item. By using layaway services, you agree to pay the retailer a certain amount on a regular schedule until it is paid off. 2. Finish with a card – As you lower your layaway balance, consider paying the last and final amount with your credit card. By following this strategy, you’ll be able to pay for the item without paying interest on the purchase – and you’ll even accrue rewards points on your credit card when it is time to pay off the last of the balance. 3. Use a card only if necessary – There are a few occasions when you need an item now, and you cannot wait. In this particular circumstance, it makes sense to use your credit card, even if you have to pay interest on the balance for a month or two. Often, the cost of interest is much lower than the inconvenience of waiting. For example, a necessary repair to your car probably cannot wait very long. 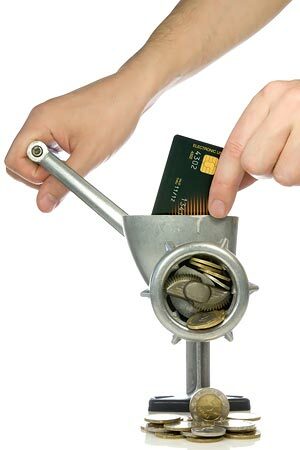 Paying with a credit card and losing a few dollars in interest is much better than going without transportation.